Oops - we don't appear to have a video for the GT-S50N. We have a number of these scanners which are used to scan documents into our Case managment system by departmental secretaries. The scanner and associated network server are very easy to install/configure, only taking a few minutes to complete. The network server can configure to use DHCP or use a fixed ip address. The scanner is supplied with a suite of software which will aloww the creation of standard file formats direct fom the scanner - PDF, JPG etc. We are very pleased with these scanners. They are easy to use, user friendly and provide and excellent desktop scanning solution in a small footprint device. 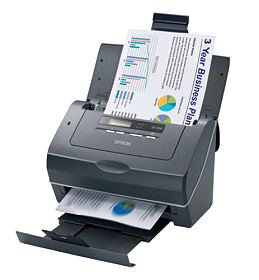 Scan your business documents quickly and at very high quality with the reliable, affordable Epson GT-S50. It scans at up to 35 ppm and 50 images per minute, and with Epson ReadyScan technology you can start work straight away. Take control of how you scan and build a complete desktop document management system. From letters and documents to embossed cards, this scanner will automatically identify, scan and send your files to where you want them. There’s even an LCD to name your most frequent one-touch jobs. The auto document feeder takes care of business while you do other jobs. Enjoy hands-free confidence with features from one-pass duplex scanning to auto blank page removal. Make the scanner available to the rest of the office with optional networking.